As a result of its acquisition by Google, FeedBurner is now offering its PRO-level services free of charge, You can now get more detailed stats on your RSS feed subscribers and re-brand your feed URL gratis. 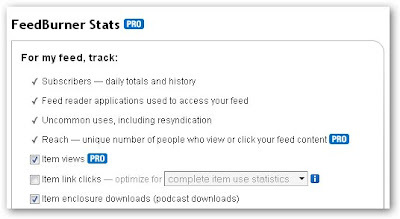 FeedBurner Stats PRO lets you see how many people have clicked or read feed items and estimates your reach, or the number of people interacting with your feed at a given time. You can tweak the settings by clicking on "FeedBurner Stats PRO" under the Analyze tab. The MyBrand service lets you change that ugly feeds.feedburner.com/YourFeed URL to a more elegant feeds.yourdomain.com/YourFeed. You'll need to be able to change your DNS settings to use it, however. To activate MyBrand, click on My Account and select MyBrand.